Most, if not all, local, national and international decisions should be made by UK Citizens collectively through online voting. My field is media and communication, social media as culture, and policymaking. There is vast evidence of political discussion existent on social media platforms, take for instance recent ‘Trending Topics’ on the platform Twitter. Controversial hashtags such as #WhyImNotVotingUKIP, I’m hesitant to use too much ‘digital-lingo,’ however it is undeniable that in today’s technology-based climate a digital approach needs to be catered for. I think the issue is the constant notion that we are not yet ready for digital democracy, for change – but when have we ever been ready for change? Digital technology is constantly changing, its power and effect are an ongoing development – leaving the implementation of digital democracy for three to five years into the future means that we’ll most likely be having the discussion as to why we didn’t embrace digital democracy sooner. The discussion of politics in an online climate isn’t going to stop just because digital voting is not executed. The interactions of voters will continue, and even rise – in 2009 political topics was only 7% of the activity and discussions on Twitter, now, in the last week alone 3 of the most popular topics discussed have been UK-based political discussions. Bringing my argument back from social media to the question at hand – I am not condoning remote digital voting, I argue that offering the facilities for digital voting in places such as libraries, or universities, may appeal more to different social groups. Starting at a local level, introducing, engaging and facilitating to public expectations will undoubtedly influence voter interaction – utilising platforms that are already promoting collective political engagement such as social media to promote digital voting. If the argument of engaging voters, or reengaging, voters is a prominent discussion then why is parliament hesitant to cater to the needs of those it is targeting? There is this stigma that a high number of citizens are not engaged with politics – I divert you back to Twitter. Politics needs to co-operate, and represent its constituents, this means engaging with the tools we use. There appears to be an unanimous outrage that online voting will disrupt democracy, that it will lead to identity-chaos – to this I raise the issue of vote-selling something which happens in an offline world. As technology develops, existing arguments develop. Democracy remains at the forefront of my debate – digital tools can enhance engagement for local; and even national decision-making. Online voting is just one, and the most current – dominant – ways this can be done. There will always be controversy – that is politics. There will always be problems, and points to discuss – that is politics. But if we are to represent everyone then as a country, as a local MP, as a collective we need to stop ignoring the popular, commonplace, ways to communicate with those whom fall under our constituencies and cater to the changing environment. The example of a sharing service that Shirky utilises within this chapter was certainly a popular platform six years ago, however in the time since Here Comes Everybody I question whether the points raised are still relevant in 2014. Admittedly I found Shirky’s metaphorical explanation of group dynamics to be slightly extensive – yet Shirky states that ‘as a group grows to even modest size, getting universal agreement becomes first difficult, then impossible.’ (2008: 27) I feel that there is truth in this testament; though, it could be portrayed as an observation, without any clear evidence. To consider this statement in relation to social media I question whether online communities offer an example of the potential difficulties that Shirky implies to be present within groups. The 2004 Indian Tsunami is another devastating event in which Flickr was used for dissemination of information. In this instance I find it interesting the use of the term ‘community’ interesting when Shirky is addressing one particular image of a missing child, when the child was found to be deceased Shirky states ‘the community that had formed around the photo posted expressions of grief and condolences for the family.’ (2008: 36) I question if the term ‘community’ denotes the activity that occurs online during disasters such as the examples presented in Shirky’s text; reflecting on Rheingold’s (1994: 5) depiction of online community as discussions with ‘sufficient human feeling, to form webs of personal relationships’ I feel that the sharing of content on Flickr does not create ‘community.’ I believe it may create feelings of belonging; or a means to express condolences. Individuals are able to express their feelings toward the disaster through commenting on Flickr photos; this, in my opinion, is similar to watching footage of a devastating event on the evening news which provokes an emotional response – simply commenting on an online post does not create community in this sense. Though interpretation of the arguments and discussions raised within this text has allowed me to consider ways to apply these notions to further research I find it ironic that Shirky, discussing the complexity of groups, uses such complex metaphors to testify his theories. How individuals interact online, or how they present themselves to others is a popular debate amongst new media scholars. Understanding user-behaviour, such as identity-making; identity is a highly contested topic alongside authenticity. Ellison et al (1997) noted that identity can be constructed in an online world; this construction can be comprised as well as constrained. User-identity may not be authentic; however user-behaviour can clearly be observed by virtual ethnography (Hine, 2000; Markham, 2005; Murthy, 2008) or other qualitative research methods. Shirky draws upon the work of physicist Philip Anderson to explore the behaviours of individuals in groups, citing his statement that ‘more is different.’ Anderson, as discussed by Shirky, noted that complexities can be exhibited in anything from atoms to people. Shirky applies this notion to his own arguments; ‘this pattern of aggregates exhibiting novel properties is true of people as well,’ more distinctly, ‘individuals in group settings exhibit behaviours that no one could predict by studying single minds.’ (2008: 28) My perception of this is that individuals may behave differently when in groups, the characteristics of a group are of the group and not a singular person: ‘these characteristics exist because groups are not just simple aggregations of individuals.’ (Shirky, 2008: 28). When considering if in fact sharing sites, such as Flickr, facilitate the anchoring of community different trajectories race to the forefront of my thinking. It is plausible to argue that sharing services such as Flickr, and more recently Instagram, offer transnational communicative space for consumers. Spatial awareness is often challenged in a digital environment, raising the complexities of participation, making Shirky’s arguments highly relevant. Yet, to consider the notion of community as perceived by theorists such as Rheingold, Baym, Jenkins and many other scholars, leads me to the direction of considering sharing sites as a mere inflection of a larger-scale network of interactions, that are far more complex, in the role of community-making behaviour. Considering whether simply ‘sharing’ content contributes to community making to me entails that the consumer, or internet-user, must be reviewed. Placing the consumer in the role of an ‘audience’ member allows me to view the audiences that interact with shared content as enigmatic. To clarify, a consumer merely ‘consumes’ the content, be it photos on Flickr, or Tweets on Twitter, yet an audience member may interact with the content in a less-consumption based way, they may recreate or react. They do not just consume, they may also produce. The term ‘audience’ can be perceived differently, Marwick and Boyd offer the idea that audience has been viewed ‘as a stable entity that congregates around a media object.’ (2010: 16). However, they then argue that this notion has been displaced, which contradicts my beliefs. Yet they offer variations to determining audience engagement and consumption which I feel apply wholly to Shirky’s depiction of Flickr and content sharing to anchor community. Terminology such as ‘interpretive community’, ‘fandom’, and ‘participatory culture’, imply that audiences, or consumers, are engaged with content, they are active and participating with the content, and the culture it produces. (Baym, 1999; Jenkins, 2005; Marwick and Boyd, 2010). To conclude, my interpretation and response to Shirky’s Sharing Anchors Community has been crafted through application of current social media sites such as Twitter. I note that I have needed to intensely apply other concepts and scholars to develop the arguments Shirky presents. This offers a clearer perspective into how Shirky’s discussions are relevant to current social media climates, yet these arguments are enhanced through further exploration of digital debates, and new media concepts. Baym, N. (1999) Tune In, Log On: Soaps, Fandom, and Online Community. New York: Sage Publications Ltd.
Ellison, N.B. McLaughlin, M.L. and Osborne, K.K. (1997). Virtual Community in a Telepresence Environment. in: Jones, S.G. (ed.) Virtual Culture: Identity & Communication in Cybersociety. London: Sage Publications Ltd.
Fernback, J. (1999). There Is a There There: Notes Toward a Definition of Cybercommunity. in: Jones, S. (ed.) Doing Internet Research: Critical Issues and Methods for Examining the Net. London: Sage Publications Ltd.
Fuchs, C. (2014). Social Media: a Critical Introduction. London: Sage Publications Ltd.
Hine, C. (2000). Virtual Ethnography. London: Sage Publications Ltd.
Jenkins, H. (2005) Convergence Culture. New York: New York University Press. Markham, A.N. (2005). The Methods, Politics, and Ethics of Representation in Online Ethnography. in: Denzin, N.K. and Lincoln, Y.S. (eds.) The Sage Handbook of Qualitative Research. 3rd Ed. London: Sage Publications Ltd.
Marwick, A. & Boyd, D. (2010). I Tweet Honestly, I Tweet Passionately: Twitter Users, Context Collapse and the Imagined Audience. New Media & Society. Vol 13, No 1, pp. 114-133. Murthy, D. (2008). Digital Ethnography: An Examination of the Use of New Technologies for Social Research. Sociology. Vol 42, No 5, pp. 837-855. Rheingold, H. (1994). The Virtual Community: Finding Connection in a Computerized World. London: Secker & Warburg. Shirky, C. (2008). Here Comes Everybody: The Power of Organizing without Organizations. United Kingdom: Penguin Books Ltd.
Twitter and UK Politics – Rise of the Machine? I’m one for using Twitter as the public sphere that it is, but it is now that I’m questioning it usage in politics. I’ve been hesitant to discuss ‘trending topics’ and comments made via Twitter in the past, as I take a rather naive stance in believing that Twitter, for the most part, acts as a way to simply express our thoughts. Whether these thoughts are positive, negative or even insulting to others there is no denying that there is a large proportion of Twitter users that are simply expressing themselves – the same way they would in normal, offline, conversation. This is a broad perspective of Twitter users – I also back the notions of authenticity, ‘trolling’ and many of the other concepts that have been theorised to describe Twitter activity. All notably highly personal, opinion-based hashtags. Both hashtags relate to voting. The commons selector committee utilised Twitter in the discussion of the Voter Engagement inquiry, with the use of the simplistic, straightforward #VoterEngagement hashtag. But is the use of hashtags such as #NVRD marginalising those potential voters on Twitter – using the ‘lingo’ and abbreviations which appear, to the non-informed, as an exclusive hashtag that formulates a discussion only for the politically-aware. It is clear, and undeniable that social media is having an impact, whether negative or positive, in influencing peoples decisions concerning voting. A key example of this is the #WhyImNotVotingUKIP hashtag, one of the most popular trending topics on Twitter November 21st. Hashtags, such as this, allow room for conversation amongst UK Citizens, yes not all UK Citizens, but there is high engagement with discussions on social media, the internet is breaking boundaries, and politics needs to engage with this. It appears this is the case, however the lack of political representation on Twitter doesn’t prevent users from contributing to discussions, (such as the aforementioned hashtags.) Maybe if more political bodies were to engage, or acknowledge this online activity then there would be less to complain about? As a political party simply Tweeting about TV coverage, or upcoming events isn’t enough. If the Twitter discussions that circulate around hashtags were to be viewed the same as offline interpersonal debating, or public discussion; then the leading political parties wouldn’t simply ignore the questions. It’s hard to deny the influence of social media in current political debates, so I think the value of these online discussions, and the usage of digital pathways by voters certainly needs to be reconsidered. Fuchs, C. (2014) Social Media a critical introduction. London: SAGE Publications Ltd.
Twitter: Breaking Boundaries or Building Contacts? 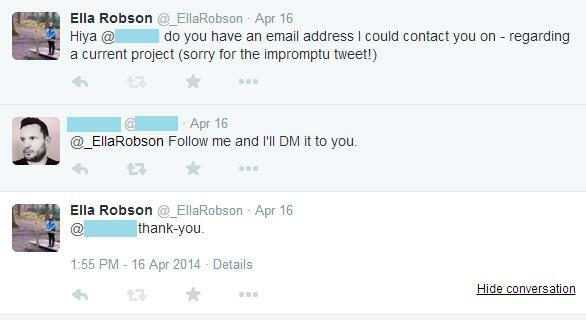 How I used Twitter to enhance Project Work. During April of this year I was in the midst of creating an audio documentary concerning an event that occurred ten years ago, throughout the process of researching and finding contributors for the project I utilised Twitter. Twitter aided in finding individuals affected by the event, and in contacting these individuals. Boscastle: 10 Years On is a project that I began working on last year, with the intentions of creating some form of audio package to commemorate (reflect) on the tenth anniversary of Boscastle Flood. In the process of planning the project I conducted research in a variety of different ways – one of the key methods was researching existing media content concerning the flood. Twitter proved highly useful for this, as it allowed me to discover companies, and people, whom live, or have lived in Boscastle. I was able to observe the online-social interactions of people discussing Boscastle, and more specifically the flooding that occurred ten years ago. The ability to search past Tweets allowed me to identify any Twitter users who may have been affected by the flood; more specifically any users that I would be able to contact for the possibility of an interview. One positive, beneficial aspect of Twitter is it acts almost as an archive, in a sense that I was able to search ‘Boscastle Flood’ and retrieve Tweets dating back two years prior to my research. Twitter was very helpful throughout the project, as I was able to keep up to date with any current discussions concerning Boscastle or the flood, (though this was only limited to Twitter.) Also, as aforementioned, I was able to use Twitter as a point of contact for contributors. 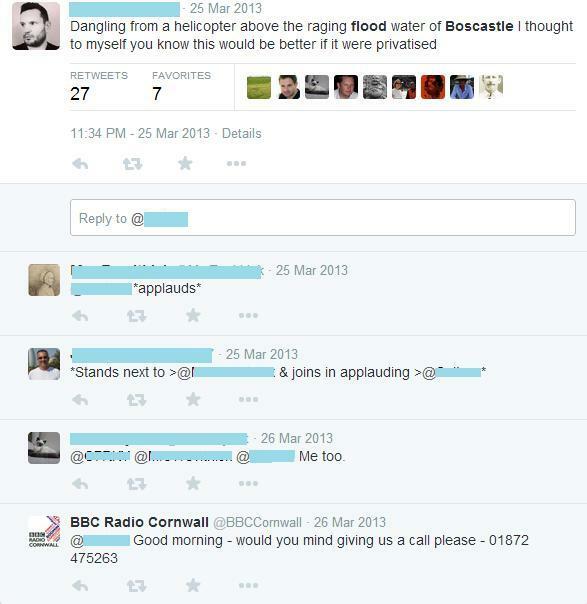 The nature of this tweet – and its content suggests that this user was caught up in the flood; it also demonstrates how other media institutions such as BBC Cornwall have used Twitter to source contributors. The contact was successful, and we then exchanged emails, and I was able to conduct an interview via Skype – producing some fantastic audio for Boscastle: 10 Years On. Breaking Boundaries or Building Contacts? Although Twitter was not my main source of content for the project it certainly enhanced my project, affecting the final outcome of the audio I produced. I’ve researched and studied (on an academic level) into social media in the past – I was interested in creating this blog as I have been considering recently how Twitter can be used for both personal and professional purpose – something which is often a topic of discussion. The example I have provided is only one case study of utilising Twitter to make contacts, Twitter helped break boundaries as the user I contacted was located in Cornwall and I was located in Birmingham. However, this is only one way in which breaking boundaries can be perceived – I am interested in how Twitter can be used as a way to contact people whom, without social media, we would find it significantly hard to contact. For example, MPs and politicians – Boris Johnson frequently interacts with Twitter users; the chances are these Twitter user are unlikely to meet Johnson in person, therefore the use of Twitter in this way is significant. Within this text I have addressed how Marwick’s work on Ethnographic and Qualitative Research on Twitter and Harrington’s work on Tweeting about the Telly influence studies of my own, both texts are chapters from the publication Twitter and Society. (Weller et al. 2013). I shall also identify key notions that derive from both texts, applying them to my own areas of interest in order to further develop my knowledge and understanding of perspectives and audience practices. With Twitter as the main foci of both texts I found each reading highly beneficial to my own interests as a key hypothesis that I wish to explore is the role of Twitter and how it hosts Mental Health discussions, and activity concerning Mental Health related issues. Though I found Harrington’s discussion of Twitter and audience engagement with television highly interesting I have been able to utilise a higher number of the arguments raised by Marwick to my own work. As a scholar interested in the effects of Social Media – with regard to audience consumption and perception – and as an active media-practitioner I found the notions developed and presented in Marwick’s chapter: Ethnographic and Qualitative Research on Twitter highly interesting. I have utilised Twitter for research purposes in the past – undoubtedly though I sit in what Marwick categorises a plethora of other subjects. This is of course from the stance of a media practitioner – I have used Twitter to aid project work in the past. The aforementioned statement forced me to consider my own usage of Twitter. I am often searching and observing Hashtags (#) as well as searching for discussions on Mental Health – a research topic which I am highly interested in. Marwick’s article is highly valuable in influencing potential research into Twitter and its role within discussions concerning Mental Health. Previously when exploring activity around Mental Health on Twitter I have used ‘TweetDeck,’ a programme that is designed to organise and track real-time Twitter activity. Yet, as suggested by Marwick, Twitter is a vast network; simply collecting data – in my research through TweetDeck – is not suitable enough for ‘describing use beyond simple queries.’ (2013: 110). If I intend to gain valuable conclusions that demonstrate the impact of Twitter on Mental Health discussions I would need to conduct greater, in-depth research using a method that collates qualitative data. Quantitative methods seek only to determine connections and networks, whereas qualitative research seeks to ‘understand meaning-making, placing technology use into specific social contexts, places and times.’ (Marwick, 2013: 119). Harrington focuses on Twitter as a ‘centralised, global platform that facilitates and extends conversations’ (2013: 238) consequently conducting research may be tiresome and difficult. Twitter ‘affords users for connecting with other viewers in real time, and engaging in live, effectively unmediated, communal discussion,’ (Marwick, 2013: 240) the vastness of Twitter, as a scholar, may appear overwhelming – a focus of study is imperative, and a research method is necessary. ‘Qualitative methods can help unpack user presumptions about individual technologies, distinguishing general communicative or social media behaviour from behaviour that is specific to a platform.’ (2013, 110). Within Marwick’s article observations into various qualitative research methods are addressed in relation to their effectiveness in drawing data from Twitter. Twitter’s structure poses limitations for conducting interviews, the 140 character limit for ‘Tweets’ provides difficulties, constraining the type of interview that takes place. (Marwick, 2013: 110). In addition Marwick implies that interviews on Twitter may result in context collapse, response to questions may be crafted to cater to the expectations of the individual’s Twitter ‘followers’, likewise users may read the questions you ask, yet choose to not reply. Though within this text I have focused primarily on Marwick’s observations I note that Harrington highlights that there is a ‘performative dimension to the act of tweeting.’ (2013, 245) This observation acts as an underlying factor, and potential focus of research for tackling the role of Twitter in discussions concerning Mental Health. Authenticity and the meaning-making of Tweets is particularly interesting, I find. Doherty, K. and O’Reilly, D. (2006). Music B(r)ands Online and Constructing Community: The Case of The New Model Army. in: Ayers, M.D. (ed.) Cybersounds: Essays on Virtual Music Culture. Kruse, H. (2010). Local Identity and Independent Music Scenes, Online and Off. Popular Music and Society. Vol 33, No 5, pp. 625-639. Pearson, R. (2010). Fandom in the Digital Era. Popular Communication: The International Journal of Media and Culture. Vol 8, No 1, pp. 84-95. Rheingold, H. (1993). The Virtual Community: Homesteading on the Electronic Frontier. Reading (Massachusetts, US): Addison-Wesley. Tweet Deck. (2014) https://tweetdeck.twitter.com/# [accessed: 11/11/14]. Weller, K., Bruns, A., Burgess, J. E., Mahrt, M., and Puschmann, C. (2013). Twitter and Society: an Introduction. New York: Peter Lang Publishing Inc.
Social Media – What I do. I utilise social media as a platform to explore my own interests, I follow musicians learn about news and events that are affecting the radio and music industry. Whilst gaining inspiration from different areas – I believe that Social Media can be used by individuals to tell stories of their lives, but also to let social media affect their lives. I have recently overcome some crazy experiences in my life, and I’d lie if I said that I avoided social media. In some ways Social Media became almost like a ‘friend’ especially when I was too scared to talk to my own friends about things that were worrying me. I never revealed anything about my issues online, instead I searched for inspiration and stories which I hoped would help me to feel inspired, yet acknowledge that others have been through similar things to me. Authenticity: Has Social Media usage obscured truthful self-presentation; is digital identity a lie? “The fact that we constantly vary self-presentation based on audience reveals authenticity as a construct” (Marwick and Boyd, 2010: 11). Without contentious intentions I agree, yet disagree with the notion of authenticity as a construct. I have conducted previous research into online-communities, in which I explored authenticity. Personally I argue that the salience of authenticity with regards to self-presentation – or representation – is applicable to different modes of computer mediated communication (CMC). Marwick and Boyd explore different avenues of the notion of authenticity as a construct: ‘Participants have a sense of audience in every mediated conversation,’ (2010: 2) the usage of ‘mediated conversation,’ implies that self-presentation comprises of the discourse used within digital communication, and that even this is unauthentic – or, at the very least, mediated. However, what is to suggest that communication outside of CMC is not mediated? It is feasible that authenticity as a construct relies on individual identity formation. Frith (1996) argues that identity is a process, an experience; the experience denotes aesthetic process and a social process. Buckingham (2008: 3) concluded that ‘[i]dentity is developed by the individual, but it has to be recognized and confirmed by others.’ (2008: 3). Drawing upon Frith’s ‘social process’ and Buckingham’s suggestion of identity relying upon peer-perception, I question if authenticity within Social Media depends on not how we alter self-presentation for an audience, but on how an audience perceives this? I believe it is possible that social interactions, such as tweets between asymmetrically related individuals reveal more about self-presentation and identity than profile information, or profile images upload onto Social Network Sites. I continue with the idea that identity is of upmost importance to authenticity. Ellison et al (1997) noted how virtuality affects personal identity; identity can be compromised as well as constrained in a virtual world. Relating this back to my discussion of interaction of users, I suggest that a user may engage differently with disparate users. ‘In lean media, people have the ability to expand, manipulate, multiply, and distort the identities they present to others.’ (Baym, 2010: 9). Hine suggested that focusing on ‘how, when and where identities and realities are made available on the internet.’ I feel that authenticity is at times a construct, however I suggest that this is a broad generalisation, as in terms of spatiality the WWW is large, and ever-changing. Boyd and Ellison utilise Walther et al’s (2008) arguments to discuss accuracy of self-presentation in CMC. ‘Profiles that are linked to a group of contacts are often more accurate than those that exist in a social vacuum; the presence of these contacts implicitly vets presentational claims.’ (2013: 164) Espinoza et al (2008) examined network usage of emerging adults, concluding that that there is a connection between their online and offline worlds; therefore if there is a correlation between online and offline then to some extent, the online self-presentation of emerging adults must be authentic? Self-presentation is, in my opinion, ephemeral – authenticity is a construct; it is a construct created by the perception of the audience and not the producer. Buckingham, D. (ed.) (2008). Youth, Identity and Digital Media. Cambridge (Massachusetts, US): The MIT Press. Ellison, N. B. and Boyd, D. (2013). Sociality through Social Network Sites. In Dutton, W. H. (Ed. ), The Oxford Handbook of Internet Studies. Oxford: Oxford University Press, pp. 151-172. Espinoza, G. Reich, S.M. Subrahmanyam, K. and Waechter, N. (2008). Online and Offline Social Networks: Use of Social Networking Sites by Emerging Adults. Journal of Applied Developmental Psychology. Vol 29, No 6, pp. 420-433. Frith, S. (1996). Music and Identity. in: Gay, P. Du. and Hall, S. (eds.) Questions of Cultural Identity. London: Sage Publications Ltd.
Marwick, A. E. and Boyd, D. (2011). I Tweet Honestly, I Tweet Passionately: Twitter Users, Context Collapse, and the Imagined Audience. New Media & Society. Vol 13, No 1, pp. 114-133. Walther, J.B. Van Der Heide, B. Kim, S. –Y, Tom Yong, S. and Langwell, L. (2008). The Role of Friends Appearance and Behaviour on Evaluations of Individuals on Facebook: Are we Known by the Company we Keep? Human Communication Research. Vol 34, No 1, pp. 28-49.